Being built in 4th century by Cholas, Temple is dedicated to Goddess Parvati, the consort of Lord Shiva. Here the Goddess is termed as “Kamatchi Amman” and she has Goddess Lakshmi and Goddess Saraswathi as her eyes. 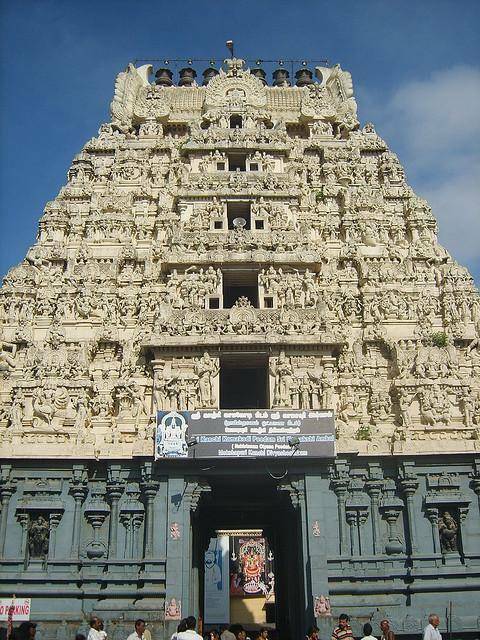 Kanchi Kamatchi Amman Temple is one among three religious centers for Shakthi Worship including Madurai Meenatchi Amman and Varanasi Visalatchi Amman Temples. Gayathri Mandapam has Sanctum Sanctorum facing Southeast direction. Amman idol has a Yantra in front of it. In ancient times, there were Champaka Tree Groves surrounds the area where there is a . Mandapam in present days. The Kanchi Mutt manages and administers the temple. As per Hindu Mythology, Devas came down to earth in the disguise of parrot and worshipped Goddess Kamatchi. The tower over sanctum sanctorum is weaved out of golden plates and also there is a Golden Chariot in the temple which is dragged in procession around the temple every Friday at around 7 p.m. Adi Shankaracharya, an ancient Hindu Sage is believed to establish this temple.